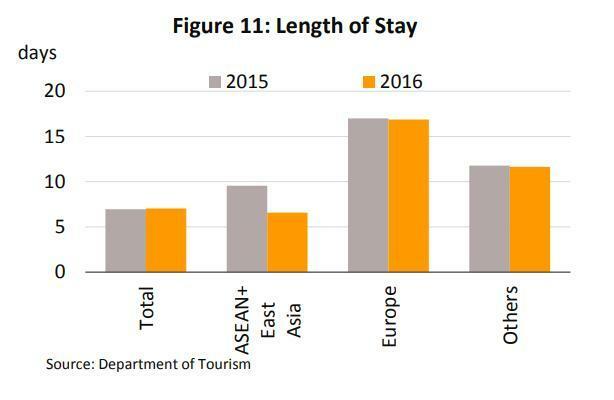 Occupancy rates and revenue for hotels will tend to grow in line with continuing growth momentum of the markets for both domestic and international tourism, in particular for increases in the number of Chinese tourists coming to Thailand, who currently account for 27% of all international arrivals. Investment in the hotel sector is also expected to continue in tourist destinations mostly along with investment plan of Thai and international chains, and in regional centers which are developing or which are home to other tourism attractions and that are benefiting from being connected to regional economic development and from building secondary tourist attractions, says “Thailand Hotels Industry Outlook 2018-20” report from Krungsri Research. At the same time, however, the sector faces the possibility of competition from substitution goods/services and from ever-increasing numbers of hotel rooms, which are helping to raise overall levels of competition. The state of the hotel sector directly relies on tourism situation. As regards the latter, information from the World Travel & Tourism Council 2017 indicates that tourism contributes around 10% of global GDP, though in the case of Thailand, this rises to over 17% of national GDP, generating THB 2.5 trn for the domestic economy. The tourism value chain scatters across the various regions of Thailand and extends beyond tourist accommodation business to include a number of other businesses, including those in the food and beverages, and transport business. Overall, it is estimated that in Thailand 4-5 million people depend on tourism for their livelihood (source: Ministry of Tourism and Sports, 2017). As regards visitors from individual countries, in 2016, China was the most important, accounting for 26.9% of all overseas arrivals (Table 2). Over the past decade, the number of Chinese tourists in Thailand has increased almost 10-fold to the current level of around 9 million arrivals in 2016. 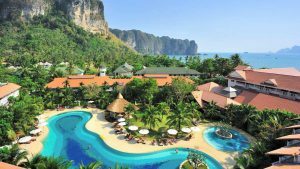 Thai hotel business has experienced oversupply situation, reflected by the low level of occupancy rate. 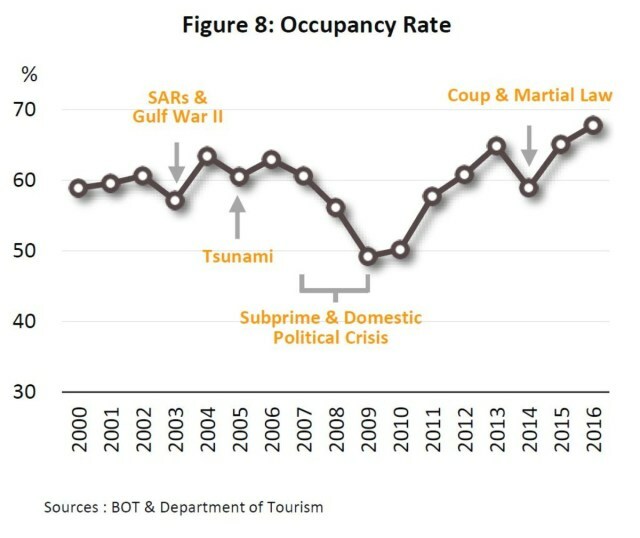 During 2000-14, the occupancy rate averaged at 59%1/ (Figure 8). This was caused by both supply and demand factors. That is, many years of fast-growing tourist arrivals encouraged new investment in hotel and accommodation. In addition, there are additional supply from apartments and condominiums, which offer daily rental rates (although this is illegal, law enforcement in this area is weak). 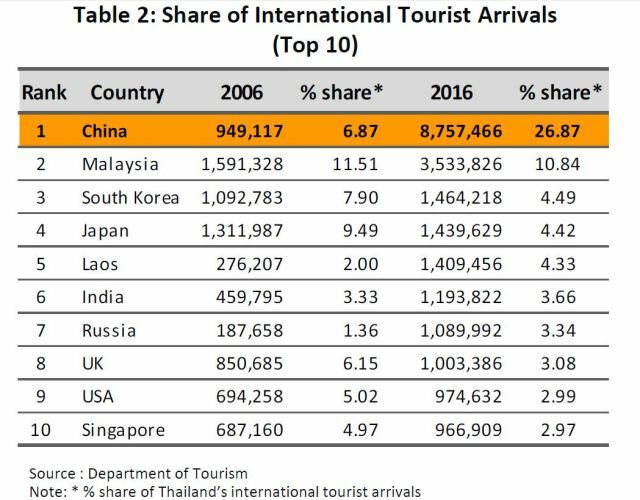 Meanwhile, the number of tourist arrivals recorded a slow growth and contraction during 2008-11 due to the continuing sluggishness in the world economy and domestic political conflicts. In 2016, the average occupancy rate rose from the previous year’s 65.1% to 67.8% due to the increasing number of Chinese tourists and greater levels of domestic tourism. The average length of stay rose very slightly, from 6.95 days in 2015 to 7.03 days in 2016 (Figure 11) but overall, because of the greater distance they travel and a strong desire to escape cold weather, European travelers had the longest average length of stay. Occupancy rates in major tourist areas which are reliant on foreign arrivals saw reasonable rates of improvement. The rate in Bangkok rose from 76.3% in 2015 to 78.3% in 2016, Phuket went from 73.4% to 74.1% (thanks to more direct and charter flights) and Chonburi increased to 75.2% from 74.8%. In provincial centers and in secondary tourist destinations, occupancy rates also strengthened, while in border regions, greater connections to neighboring countries also contributed to rising occupancy rates.